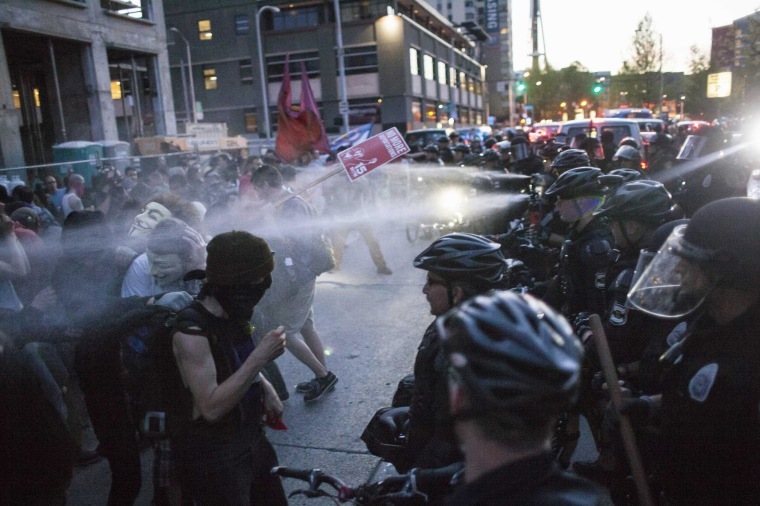 Anti-capitalist protesters hurled firecrackers, bottles and bricks at cops and destroyed property during a May Day march through the Seattle, police said Friday. Nine people were arrested, including one man who had a gun recovered from him, during the annual march that has been plagued with violence over the last two years, Seattle Police Department said on their blog. The march heated up as the march made its way into downtown Seattle, according to NBC station King 5 and Police said suspects threw bottles at officers and Metro buses. A driver in a convertible got caught in the march was surrounded by protesters who damaged his car, but did not injure him. A skirmish also broke out between people dressed as “superheroes” and "black clad adversaries" police tweeted. Possibly anticipating trouble Seattle PD said there was a “substantial police presence” in the city and they had called in officers from other jurisdictions for assistance. “Officers found ‘Kill SPD’ spray painted on a bank,” and the anarchist symbol paint on a car dealership police said on their blog. Threatening posters with messages like “the only good cop is a dead cop” and photos of a burnt and battered SDP officer shaped piñata had also been found in the run up to the march.